Browse: Home / 2016 / June / 14 / Powerful Natural Oceanic Factor Confirmed ….Global Surface Temperatures Continue Their Fall! Schneefan at his site here writes about the unusually wet weather Europe has been experiencing lately. This has to be upsetting to global climate modelers and scientists, who years ago claimed Europe would have to expect hot, dry summers involving severe periods of droughts. That prediction has turned out to be totally wrong. The very opposite has in fact occurred. The reason for the recent wet conditions are likely in part due to the post (natural) ENSO activity of the past months, which have disrupted weather patterns, Schneefan suspects. “The regional development in Europe is affected by the rash global cooling following the El Niño peak in global temperatures in February 2016. The rash cooling is also continuing in June 2016 and will lead to further high precipitation in places like Australia. The above plot shows the 2-meter surface temperature deviations (black line) and that of both hemispheres. 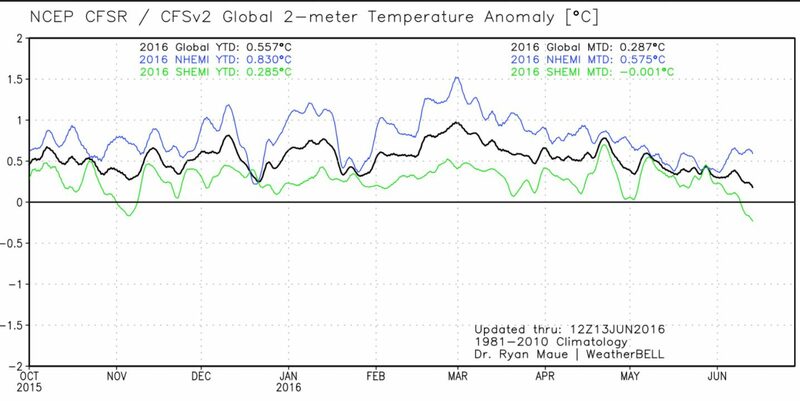 Since the El Niño peak of late February, the temperatures by June 13 have fallen off steeply. The SH (green line) is already in the negative. 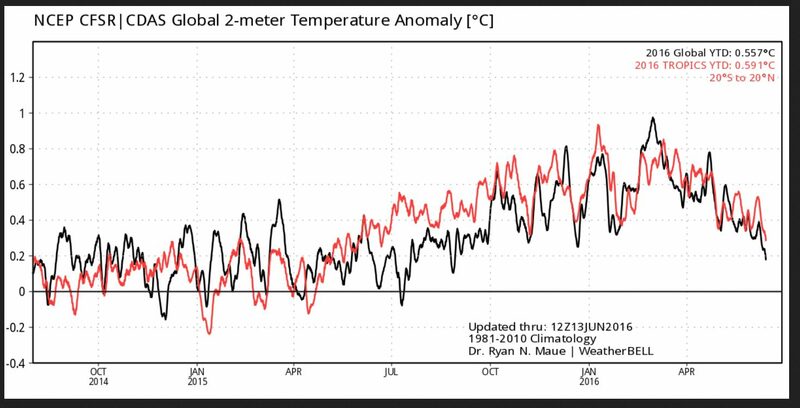 The black line for global temperature is approaching zero. Source: weatherbell.com/temperature.php. The plot above shows the deviations in ocean surface temperatures (SSTA) in the main Niño-area 3.4. 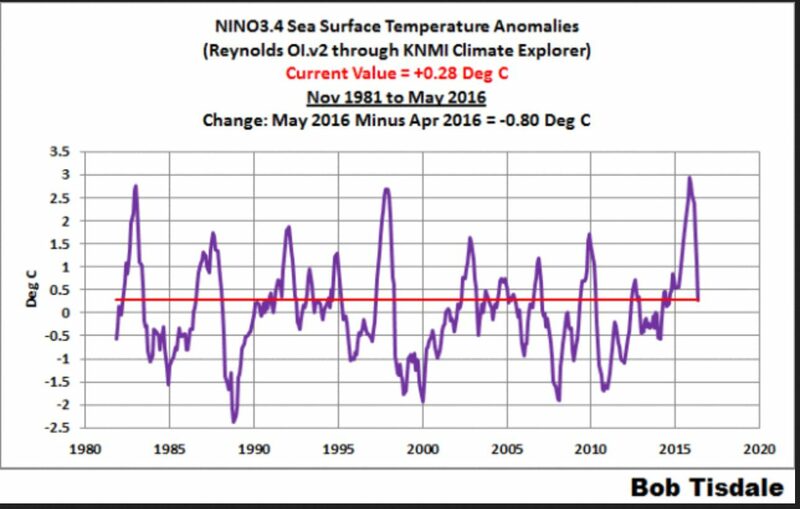 The deviation in May 2016 fell 0.8°K compared to April, 2016, and thus are now 0.3°K below the +0.5°K El Niño minimum value. What stands out is the large difference from the altered NOAA value of 0.64(! )°K for May 2016. Source: May 2016 Sea Surface Temperature (SST) Anomaly Update. Moreover solar activity remains weak as no sunspots have been observed for the 5th consecutive day. It’ll be interesting to see what major weather pattern will be in place in early July (Seven Sleepers Day). Perhaps there will be a stable omega high over Europe…? And still, none of this is relevant on a geological time scale which has been and seems to remain the most apparent caveat to the whole theory. Or, on an actual temp scale – let’s say Kelvin. The entire process has been a charade. 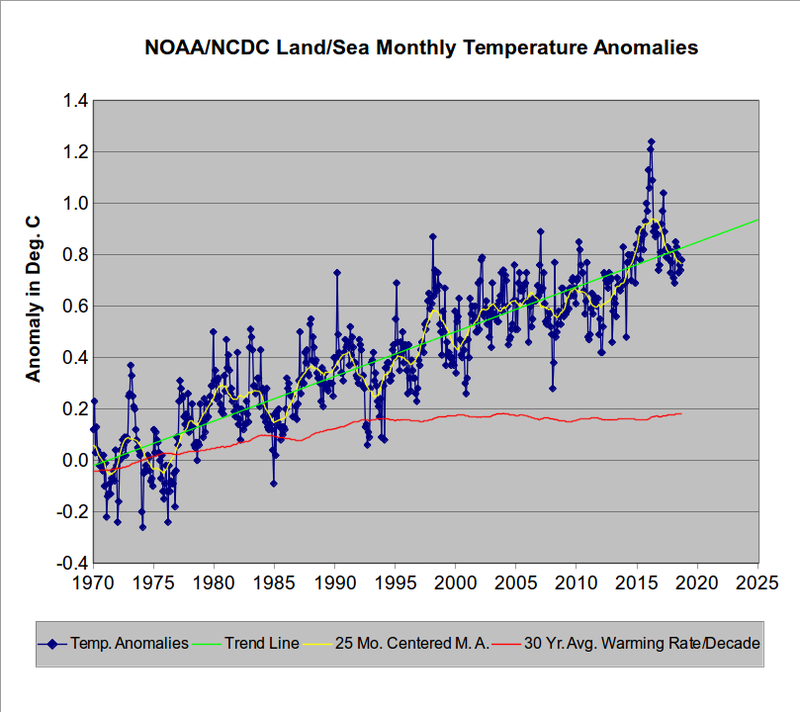 No global warming since March 2016 – confirmed by NOAA. April 2016 temperatures were below those recorded in March, and May temperatures (due out June 16) are expected to be cooler yet. This time, global warming really has stopped.